Learn how to save money now on doctor visits, prescription medications, acute illness, chronic disease, hospital bills, medical testing, and much more. This book can help every American, insured and uninsured alike, lower their healthcare expenses by hundreds to thousands of dollars. 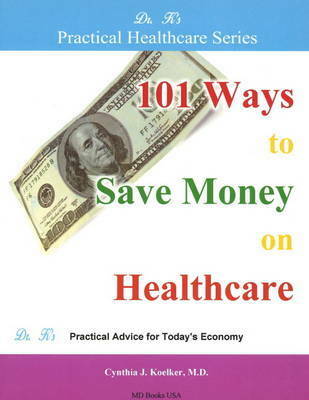 Written by a family physician with decades of clinical experience, "101 Ways to Save Money on Healthcare" offers an insider's perspective on medical billing, pharmaceutical pricing, hospital costs, ancillary services, medical testing, and dozens of useful home therapies. Hundreds of resources are included in this fully indexed, easy-to-read, consumer-oriented manual - a valuable resource for both patients and professionals. Cynthia J. Koelker, M.D. is a board-certified family physician with over twenty years of clinical experience. A member of American Mensa, she holds degrees in biology, humanities, medicine, and music from M.I.T., Case Western Reserve University School of Medicine, and the University of Akron. She served in the National Health Service Corps to finance her medical education. The author continues to practice medicine in Akron, Ohio.